I first met Dana Cann when I was teaching a novel workshop at the Writer’s Center back in the olden days. He was a wonderful writer, devoted to the craft, and exactly the kind of person you want to stay in touch with after class. He wrote a piece for Work in Progress that remains one of my favorite guest pieces to this day—“200 Words and a Cloud of Dust”—outlining his approach to getting the work in, day after day, even if only 200 words at a time, even if only 15 minutes at a stretch. 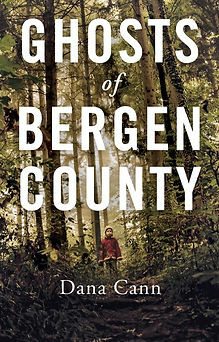 And now, proving the power of discipline and showing us that 15 minutes a day IS enough, here, happily, is his first novel: GHOSTS OF BERGEN COUNTY. Gil and Mary Beth Ferko moved to Bergen County thinking they would lead a typical suburban life: Gil commuting daily to Manhattan; Mary Beth a stay-at-home mom. But after a hit-and-run accident kills their infant daughter, Mary Beth becomes a shut-in. When Gil reconnects with a high school classmate, Jen, she introduces him to heroin. As his dependency on the drug grows, his downward spiral puts his life in danger and his career in jeopardy. Mary Beth has also found an escape—first in prescription drugs that numb her senses, then in the companionship of a mysterious girl who heightens them. And Jen is also haunted. Years ago she witnessed a man she had just met fall from a rooftop. She walked away from the accident and has been tormented since by the question of why she did so. As her quest to rectify that mistake collides with other mysteries and traumas, all the characters must face the fine line between fate and happenstance. Publishers Weekly: "Cann’s novel is an impressive, accomplished effort, nuanced in its depiction of complex interpersonal drama and eerie elements of the supernatural." Full review. A private-equity guy and his wife, a recluse since their baby’s death, confront grief amid addictions and the company of a mysterious girl. I’m always interested in point of view…how and why did you choose the POV you did? GHOSTS OF BERGEN COUNTY utilizes a third-person, limited point of view. Each of the three principal characters—Gil, Mary Beth, and Jen—is a point-of-view character, and the shifts in point of view typically (though not always) occur at chapter breaks. Third-person limited, with multiple point-of-view characters, is a pretty conventional way to write a novel. When I first started writing GHOSTS, my intention was to utilize a third-person omniscient point of view, where the point of view could shift more fluidly from character to character, but I quickly nixed that ambition when it became apparent that the number of choices I’d need to make would increase exponentially. Plus, I was confusing the generous, smart readers in my writers’ group. I don’t aim to confuse readers. Plot or characters? Which comes first for you? Or is it something else? Definitely characters. However, GHOSTS OF BERGEN COUNTY has a pretty intricate plot. This was a surprise for me, when the plot began to emerge as I was writing the novel during a particularly fruitful residency at the Virginia Center for the Creative Arts. I had a plot! I’d never written anything with an intricate plot before. I was about halfway through the first draft at this point, and I had to circle back to the beginning to capture my new discoveries. Some early readers have noted that the characters are well developed, while others have noted that the plot is well developed. I like to think that this is a novel that promotes both elements in equal measure, that neither takes a back seat to the other. You have been part of a writing group for sixteen years, which I find an impressive length of time. Can you tell us more about your group and speak to its benefits (and any drawbacks)? My writers’ group, which currently consists of seven fiction writers, has been invaluable to me. It forces me produce new work because I have deadlines every few months, it provides me with smart and generous feedback on my work, and it allows me to read the work of my peers critically, which is an important skill for a writer to hone. There are few drawbacks I can think of. Maybe one is that novel chapters are more difficult to critique than short stories, since novels are often written over many years, and it’s difficult for a critique group to read a chapter or two at a time every few months. We formed the group from a short story workshop we took at The Writer’s Center in (I think) 1999. We meet once a month. We’ve had remarkably little turnover over the years. Four of the original six members are still in the group. We’ve now published five books (three novels and two story collections), plus several dozen short stories in literary magazines and anthologies. What is the best piece of writing advice you’ve heard, and how did you apply it when working on GHOSTS OF BERGEN COUNTY? Writers write, every day, no excuses. This may be more mantra than advice, which probably makes it more valuable, since it’s something you can tell yourself and believe in. Writing is like physical exercise—the more regularly you do it, the easier it is. While writing every day is fabulously terrific advice, I’m embarrassed to admit that I’m not as disciplined as I should be in following it. The truth is that sometimes life gets in the way. Sometimes I have excuses. Sometimes I make excuses. Sometimes I feel like watching a baseball game on TV. What really got GHOSTS OF BERGEN COUNTY over the finish line were two residencies at the Virginia Center for Creative Arts. For a writer like me, with a day job, to be able to take two or three weeks at a time to do nothing but write was huge. Dana was born in Santa Barbara, California, and raised in the Maryland suburbs of Washington, DC. He's worked in commercial banking, corporate finance, and restructuring. His short stories have been published in The Sun, The Massachusetts Review, The Gettysburg Review, Fifth Wednesday Journal, The Florida Review, and Blackbird, among other journals. He has received fellowships from the Virginia Center for the Creative Arts and the Mid Atlantic Arts Foundation. Dana earned his M.A. in Writing from Johns Hopkins University. He lives in Bethesda, Maryland with his wife and their two teenage children. Dana teaches fiction workshops at The Writer’s Center. Ghosts of Bergen County is his debut novel.